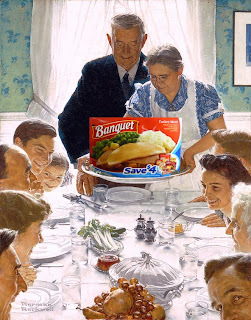 This Deal of the Day is the anti-Norman Rockwell Christmas dinner. I've had my share of sad Christmases (and Thanksgivings). This happens when you are single and first move into a new city, or you could be out of town on business. And, on some holidays everyone you know may be visiting relatives. While one does feel self-conscious eating alone during the holidays, there is something to be said of being out of the holiday family drama loop. And this Turkey Dinner by Banquet is a meal you do not want to share -- nor could you do so, with its small serving size. I always find them at the grocery store for around a dollar, and they show up at my local 99c only Store from time to time. The package cover actually matches the real meal, this time around. 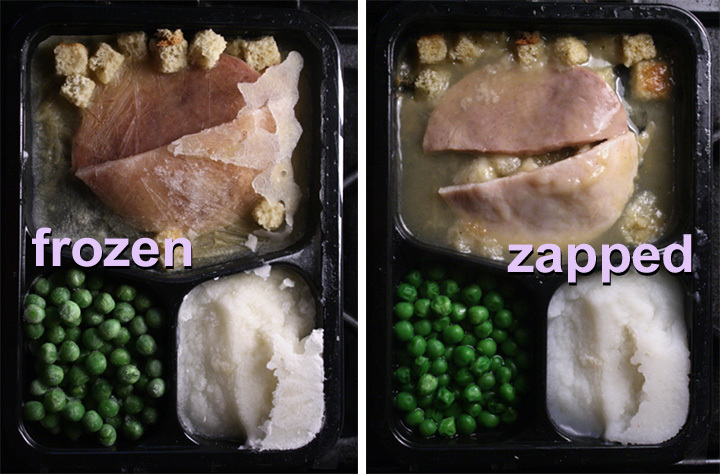 I actually like this frozen meal -- occasionally. 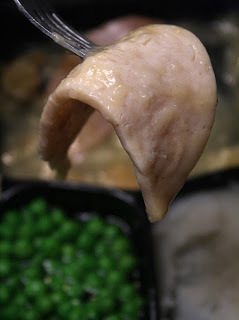 While the turkey has the texture of baloney, and the stuffing amount is miniscule, and if you close your eyes, you would think you are having the real deal, as all the flavors are there. 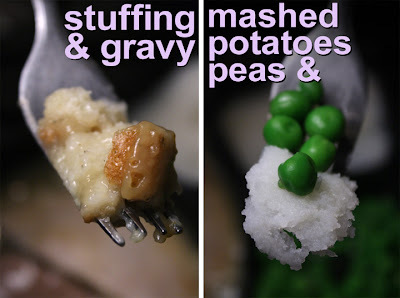 There is an ample amount of gravy to swab about the mashed potatoes, and the green peas are firm and tasty. The gravy has a deep turkey broth flavor, although, it overpowers and drowns the stuffing. The real weakness is the powdery instant potatoes. They dissolve once the gravy is mixed in. I don't know why the Banquet food scientists haven't figured out how to do it right -- after all these decades of frozen entree development. Their potato formula needs bulking up. And, a touch of butter (flavoring) wouldn't hurt. The two turkey loaf slices appear to be white and dark meat. I couldn't tell any difference in taste. The mechanically separated turkey loaf doesn't compare to a fresh slice of steaming turkey breast, but for a buck, it will do. 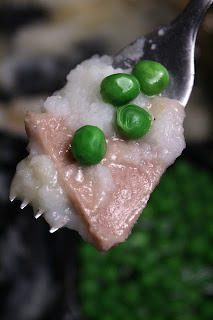 The peas, of all the ingredients, are the real winner on the black plastic plate. They taste flash fresh frozen and are firm, not a typically mushy defrosted entree -- they're as good as any name brand frozen pea. 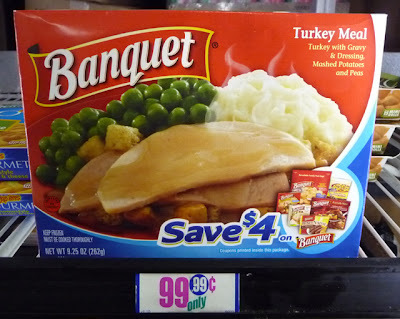 So if you are alone and broke this Christmas, I would recommend Banquets Turkey Dinner. On a scale of 1 to 9, 9 being best, I give it a 5. You would not be to far off to think the Grinch left this small entree under your tree -- and, you would need to consume 2 or 3 of these minuscule meals to get that second-serving bloated afterglow. Now, don't worry that The 99 Cent Chef is unhappy this holiday. We are entertaining my in-laws with a Prime Rib Roast for Christmas at the Chintzy Chateau. And, my next post will not be depressing -- because, my Mom is back with another holiday dessert recipe video: a sweet and luscious homemade Pumpkin Pie! Entertaining post as have many a Banquet meal; while not as good a home cooking, many are better than fast food or worst yet, the "Wheel of Death" sandwich machine where I used to work 3rd shift and are less expensive. I've managed to eat this myself. I think Marie Callendar's is a teeny bit better b/c they offer cranberry. Sometimes the holiday's are sad when you've also suffered the loss of a loved one. I hope you and yours have a Merry Christmas!